Set within the picturesque town of Cranbrook in a prime non-estate location backing on to open playing fields is where you will find this extremely well presented four bedroom link detached home. The property has a wide range of features which include gas central heating via radiators, double glazing, kitchen/breakfast room fitted with a range of appliances together with a useful, separate, utility room. There is a downstairs cloakroom, separate study and lounge dining room with French doors opening to the rear garden which has a wonderful westerly outlook over the adjoining school playing fields. At first floor, the master bedroom has an en-suite shower room while the three remaining well proportioned bedrooms have access to a family bathroom. Ample parking is provided with a driveway large enough to accommodate several vehicles which in turn leads to the integral garage. Cranbrook itself is Kent's smallest market town and is renowned for its eclectic mix of shops, cafes, restaurants, boutiques as well as a Co-Op, hotel and pub. Cranbrook offers a variety of sports and social activities including the nearby Weald Sports Centre with its swimming pool, gym and badminton halls. Cranbrook School, renowned and sought after for its excellent reputation and educational facilities is located in the town. In addition to Cranbrook School, there are other excellent schools, namely Bethany, Benenden school, Marlborough House, Saint Ronan's, High Weald Academy and Dulwich Prep School. For the commuter traveller the A21 offers excellent links to the M25 and other motorways. Cranbrook is approximately equal distant from the major town centres of Tunbridge Wells, Ashford and Hastings. The mainline station at nearby Staplehurst offers trains to London Bridge, Waterloo, Charing Cross and Cannon Street. As properties rarely become available in this much sought after location we can only emphasise the need to arrange an early appointment to view to avoid missing out on this wonderful opportunity. ENTRANCE HALL: Coved ceiling with downlighting, single radiator, dado rail, power points, telephone point, understairs storage cupboard, personal door to garage. DOWNSTAIRS CLOAKROOM: White low level wc, pedestal wash hand basin, half height tiling to walls, tile effect vinyl flooring, coved ceiling, window to front, single radiator, ceiling downlight. UTILITY ROOM: Fitted with matching wall and base units with work surfaces over, stainless steel single drainer sink unit with mixer taps, space for washing machine, fridge etc. Tiling adjacent to the worktops, ceramic tile floor, wall mounted baxi gas fired boiler, central heating time clock and programmer, single radiator, part glazed side door. 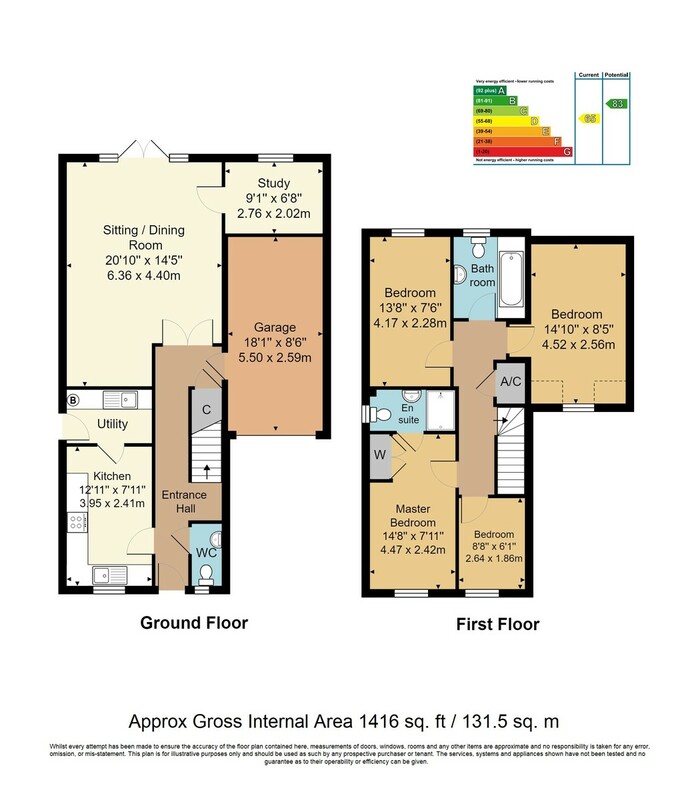 STUDY: Window to rear, single radiator, power points, range of fitted book shelves to one wall, telephone point, coved ceiling, access to loft area. FIRST FLOOR LANDING: Dado rail, coved ceiling, built in airing cupboard containing the hot water tank with immersion heater and shelving above. MASTER BEDROOM: Window to front, single radiator, coved ceiling, built in double wardrobe, access to loft space. EN-SUITE SHOWER ROOM: White suite comprising of a low level wc, pedestal wash hand basin, separate shower cubicle with plumbed in shower, tiled shower area and half height tiling to walls. Tile effect vinyl flooring, shavers point, single radiator, side window, coved ceiling, extractor fan. BEDROOM: Dormer window to front, single radiator, coved ceiling, power points. BEDROOM: Rear window with views over school playing field, single radiator, coved ceiling, power points. BATHROOM: White suite comprising of a low level wc, pedestal wash hand basin, panelled bath with mixer taps and hand shower spray, pine panelled walls to dado rail height. Window to rear, single radiator, tile effect vinyl flooring, extractor fan. OUTSIDE REAR: The garden benefits from a westerly aspect and includes a paved patio area and pathway which continues to the side and leads through a gate giving access to the front. The garden is mainly laid to lawn surrounded by mature borders stocked with a variety of shrubs and plants, fencing to side with picket fencing across the rear to allow the garden to enjoy the views over the adjoining school playing field and distant views of the windmill. Outside light and tap. FRONT: Open planned lawned garden, several shrubs, driveway providing off road parking for several vehicles leading to the property's entrance and garage. GARAGE: With up and over door, internal power and light, personal door to hallway. AGENTS NOTE: Estate Agents Act 1979. Messrs. Wood & Pilcher for themselves and their staff declare an interest in this property as the vendor is a Director of Wood & Pilcher.